Let me explain that the poster was for Ali’s Big Ride http://www.alisbigride.co.uk/ . Alistair was a brave and incredible boy who impressed everyone he met with his courage, his fight, his desire for life and his natural ability to bring humour to all situations. Unfortunately in December last year, Alistair, aged 6 died of Juvenile Myelomonocytic Leukaemia. So in his memory his father and nine of his father’s closest friends came together to undertake an amazing fundraising (Royal Marsden) adventure in the form of a cycle ride from John O’Groats to Lands End, starting July 16th and travelling 866 miles over 10 days, dressed as some of Alistair’s favourite superheroes – Batman, Mr Incredible, Zorro, Bicycle Repair man, Bananaman, The Thing, Cooperman, Red Ranger, The Mighty Thor and Captain Underpants. Here at Fine Fettle we have a group of fantastic, highly qualified and generous practitioners who were all willing to give support to the challenge. They all stepped up to the mark in providing free massage and therapy treatments for all the riders in the weeks leading up the adventure. They worked as a team giving them nutritional, training and injury prevention advice for their training schedule. Now although we would love to claim we did lots of hard work, it was nothing compared to the amount of training and self dedication that the group of superheros put in and what a mammoth effort to cycle the length of the country. As part of our support I agreed to provide Osteopathic and Sports Massage support to them on their trip down the country. So on Monday 19th July, I spent 7 hours on a coach travelling to meet the guys after 400 miles of cycling in 4 days, in Carlisle. I left London in the scorching heat but arrived to gail force winds and pouring rain in Carlisle. 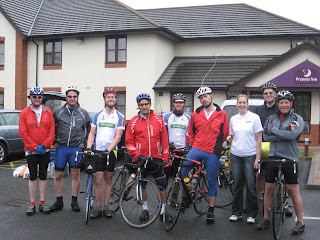 The guys all arrived safely but they were weather beaten as it had been windy and wet since the start. A few of them wondered if they were just cycling under the same cloud travelling the same way. So at 10.30 pm I was still fixing and patching and treating any injuries or aches and pains. They had a few! Unfortunately one of them was suffering from a suspected stress fracture so a trip to the Carlisle casualty unit was in need. The next morning they were all up bright and early and ready for another day. I was to return to practice in Bookham to treat my regular patients and then return to Bristol to meet them again on the Tuesday. The funniest thing that morning was one rider who had hit a bridge the day before and had broken his brakes. True to form Cycle repairman came to the rescue with an elastic band and off they all went! Most up to date bike repair kit…. Look closely! Hels and the guys in Carlisle. On Thursday 22nd July, after a full day in practice, I drove up to Bristol to treat and fix again. There were lots of sore quads so I showed them all how to strap their thighs to alleviate some of the pressure on their overused muscles. They were still in high spirits - a testimony to their courage and determination. It was still raining on them each day!! The only real injury was a case of acute achilles tendinitis. Always an interesting one to treat, as the squeaking of the inflammed tissue always makes me smile. Anyway, I used massage and dry needling to the area and the superhero was able to continue the journey down south. A late night drive home for me before practice my patients in the morning!! I am glad to say that the guys reached Land’s End on their target day on Sunday 25th July 2010. Although I was not able to travel to meet them I understand that a good time was had by all especially the families that had travelled to meet their loved ones.